With 60s pop music going psychedelic, The Hollies' Graham Nash wrote a song about the hippie trail in Morocco. But it had to wait till he teamed up with David Crosby and Stephen Stills. By the late 60s, Morocco was fast becoming an essential stop-off point on the new hippie trail. It was a place frequented by seekers of all stripes, from travellers and the more adventurous tourists through to artists, writers, fashionistas and rock stars. They were all drawn by the exotica of this storied corner of North Africa, whose heady promise of spiritual enlightenment and hashish served to melt away the conventions of the West. The song itself was written during The Hollies’ Yugoslavian tour of June 1967. It was one of a number of new tunes that showcased Nash’s outward growth as a songwriter as he attempted to steer The Hollies away from the confines of the singles market into the more lysergic, experimental realm of peers like The Beatles and The Byrds – though the rest of the band didn’t all share his vision. Initially reluctant to record Marrakesh Express at all, The Hollies only got as far as cutting a backing track at Abbey Road in April 1968. Nash, who remembers that “it wasn’t very good”, explains that he’d written a bunch of similar songs at that point – among them Lady Of The Island and Right Between The Eyes – which The Hollies weren’t moved by either. It wasn’t just the tunes. Nash’s burgeoning interest in the counterculture and its lifestyle meant he was the only band member to embrace LSD and marijuana. Allied to the fact that King Midas In Reverse, one of his finest compositions, had only been a moderate hit, Nash sought a move away. “Yeah, it was obvious that my career with The Hollies was coming to an end,” he says. Crosby and Nash would bump into each other regularly over the next couple of years and, by the summer of 1968, both men found themselves at a critical juncture in their respective careers. Ever the egotist, Crosby had been ousted from The Byrds less than 12 months earlier. And while Nash had already decided to quit The Hollies, Stephen Stills’ tenure in dynamic LA rockers Buffalo Springfield had also come to a close. Stills and Crosby had been jamming informally for months before Nash was invited into the fold. The rapport was sensational. 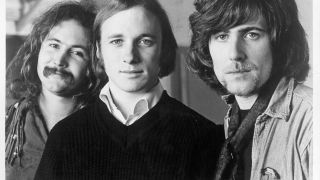 Grounded by Stills’ masterful guitar playing and achieving lift-off with their gorgeous three-way harmonies, Crosby, Stills & Nash were suddenly a serious concern. In November 1968, Nash officially left The Hollies, heading out to California and taking up temporary residence at Crosby’s place. When it came to selecting songs for their self-titled debut album, Nash revived Marrakesh Express. Easily the most ‘pop’ song in the CSN canon, it was recorded at Wally Heider’s LA studio in February ’69. Stills’ guitar races along at a clip, echoing the literal rush of Nash’s Casablanca train and imbuing the song with a wondrous sense of buoyant optimism. There’s a smattering of nonsensical wordplay to begin, before Nash begins to sing in his warmest tones, exhorting everyone to climb aboard. You can almost feel the sunset through the windows. Issued in May 1969, the album marked out Crosby, Stills & Nash as America’s first great supergroup and provided the counterculture with its definitive soundtrack. Marrakesh Express was released as the lead-off single and made the Billboard Top 30. Over here it reached No.17 and remains the only UK Top 20 hit of CSN’s entire career. It’s a song that continues to run on in its creator’s heart.